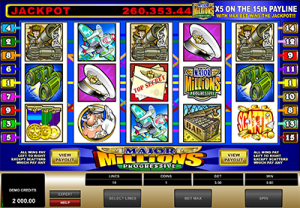 Major Millions is one of Microgaming’s original and oldest progressive jackpot slot games, a fact hard to ignore given the now outdated graphics, but thanks to the potential the game has to produce some hefty wins, it remains one of Microgaming’s most popular online slots. Here’s how and where can play one of the Internet’s longest running progressive jackpot games for real money. Major Millions is a five reel, 15 payline video slot game which gives you the option of customising the amount of active paylines and number of coins per spin. You can customise your bet by clicking on the ‘select lines’ button at the bottom of the reels, or press the ‘max bet’ button to automatically place the highest bet allowed. The maximum bet is a low $3.00 per spin, an amount which must be in place in order to win the progressive jackpot. Once your desired bet is in place, click the spin button to play. Unlike most other online slot which can be played for free in demo mode, Major Millions and other progressive jackpot games require real money bets in order to play. Sign up for an account with a reputable casino like the ones we’ve recommended below, head to the casino banking section and make an instant, safe deposit using credit card, debit card, e-Wallet or pre-paid voucher. Scatter symbol – you can’t miss the scatter symbol, its marked as such and is covered in exploding gold coins. Scatter wins can pay anywhere across the reels, with scatter wins added to payline wins and multiplied by the total number of credits wagered. Wild symbol – the wild is the Major Millions symbol which substitutes for all other symbols to form a win except for the scatter symbol. Any win including a wild symbol will automatically triple your win. If you manage to line up five Major Million wild symbols on paylines one to 14 you can win up to 8,000 credits. The progressive jackpot is the real drawcard to this game and if we’re honest, the only reason worth playing Major Millions. The base jackpot starts at $250,000 and grows every time a real money bet is placed on this game anywhere within the linked Microgaming progressive network. Many players have walked away millionaires after a few spins on Major Millions, with the biggest winner ever claiming $1,801,598. To win the jackpot, the maximum bet must be in place. You’ll then need to line up five of the Major Millions wild symbols across the 15th payline. As an old classic, you’ll find Major Millions at a majority of leading Microgaming-powered casinos, as well as some of the best multi-provider slot sites. As real bets are required to play progressive jackpot games, our top-rated real money casino sites for safety and banking methods are listed in the recommended casino table above. Each of these sites is accessible in instant-play mode, so you can play Major Millions directly over your web browser without the need to download any additional software. You’ll also find a selection of Microgaming’s more popular progressive jackpot slots like Mega Moolah, Mega Moolah Isis, and many others. All of our recommended casinos are protected by secure digital encryption security to allow safe bets with vigilant protection of your personal financial information. Perhaps we’ve become spoilt due to the advanced technology and high quality animation we’re now used to seeing in new releases from NetEnt, Thunderkick and BetSoft, but it’s hard to see past the outdated graphics and clunky reels of Major Millions. In saying that, with jackpots which on average sit in the hundreds of thousands of dollars, who are we to turn our noses up. If you’re looking for cutting edge graphics and an intriguing game theme, Major Millions certainly isn’t the game for you (perhaps try NetEnt’s Divine Fortune if you’re looking for a progressive jackpot game with an edge), but if you revere big jackpots over graphics and special features then you’ll certainly enjoy Major Millions – and who know, you just might walk away thousands of dollars richer. Given there are no bonus features in Major Millions beyond the progressive jackpot, we’d recommend if you can’t afford to place the maximum bet, your money is better spent elsewhere. Take Major Millions for a spin at Jackpot City Casino and claim up to $1600 in welcome bonuses when making your first few real money deposits.